The double top is a powerful bearish reversal chart pattern that often appears at the top of a move. Stocks often correct or crash when this pattern appears. Some traders love to short stocks that form the double top pattern. Even if you do not play this trading strategy, you can still benefit a lot if you see this chart pattern appear in your stock. When you combine the powerful bearish reversal signal in a double top with other technical concepts such as resistance, you can often anticipate a drop in the stock. 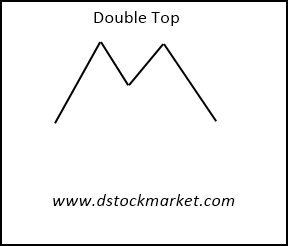 The above is what a double top looks like. It looks like two mountain peaks. Or you could say that it looks like an "M". If a stock is still trending up, it will be able to make a higher high. The double top has two same highs. Since the stock is unable to make a higher high, this tells us that the bulls are getting tired. The bears may be coming in to drag the stock lower. Double tops are notorious for warning traders of a big correction in a stock. Sometimes it can be a big decline as well. So whenever, a stock is in the process of making a second high, you always want to be on the lookout for a failure to make a higher high. The chart above is the daily chart of COST. COST made the first high in early May 2017. In early June 2017, the stock tried to rally but it failed to go above the previous highs in May 2017. This set up what we refer to as a double top. At this point, the trader does not know yet if the double top will be successful. However, we want to always be cautious when a stock cannot go above a previous high. This is a warning to us that the stock may not have the firepower to move higher. 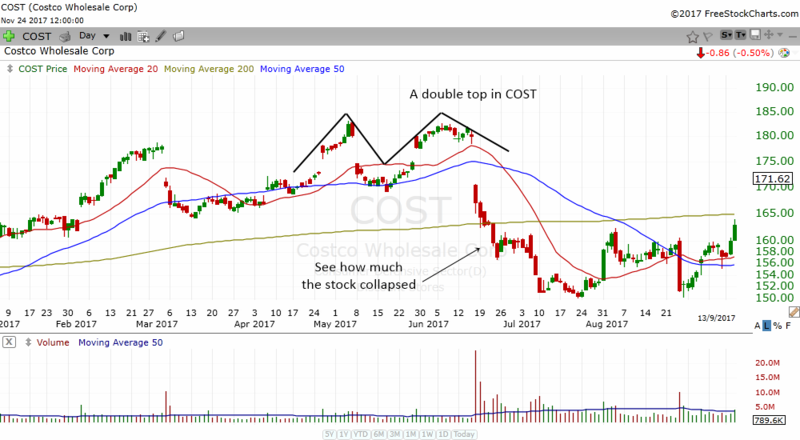 This is true for COST where the stock failed to make a higher high and eventually it formed a double top. COST gap down and this completed the double top pattern. Look how far the stock fell. Any trader who was holding COST would be cautious and perhaps even sell 1/2 of their position as the double top was forming. Chart patterns usually come with a targets for traders. This is no difference for the double top pattern. You can set a target by taking the height from the middle of the "M" pattern to the top of the pattern. Then project the height downwards from the middle of the pattern to get a target. 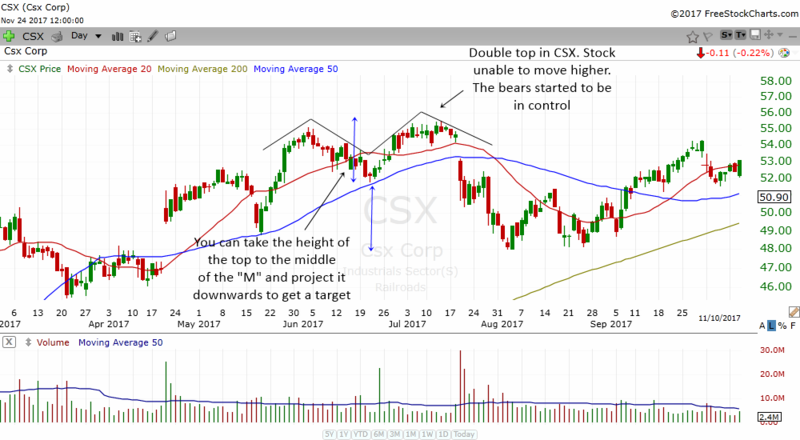 In the chart above, CSX formed a double top. The stock actually penetrated above the previous highs but it was unable to carry on the upward momentum. A double top formed and the stock gap down and proceeded to move lower. Notice how the stock easily met the target. The target was actually the exact low that CSX made and from there the stock started to move higher. You have now learned a very useful bearish reversal chart pattern. The double top not only appears in the daily chart. They often appear in other time frames as well. Some traders will play the double top in intraday charts as well. The next time you see this chart pattern, pay attention. You might just be able to avoid a big loss if you are holding the stock. Perhaps you might even find it as a good shorting opportunity.